Kankaria Lake is a multisided artificial lake with thirty four sides built by Sultan Qutab-ud-Din in the year 1451 A.D. People are of the say that Kankaria lake of Ahmedabad was often visited by the Mughal Emperor Jahangir along with his wife Empress Noor Jahan. Apart from its historical importance; Kankaria Lake is one of the most favorite picnic spots of the people of Ahmedabad. Adjacent to the lake there lays a beautiful garden called Nagina Wadi. The pleasing view of the lake, the humming and chirping of birds and the greenery bordering the lake will make you fall in love with this place. You can also avail the boating facility. Kankaria Lake provides a beautiful view of the sunset. There is also a zoo and children's park located nearby the lake. One of the most admirable monuments in India, the mosque of Sidi Sayed is loacted near Lal Darwaja. The mosque is world renowned because of its splendid Jali or Mesh which is a finest example of Indo-Saracenic architecture. The mesh is framed inside ten semi circular windows. The filigree has been carved out of just one rock. 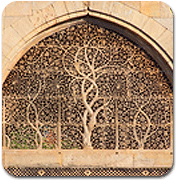 The tracery of the mesh or jali is the completely bewitching and will make you have a mesmerizing experience in Ahmedabad. 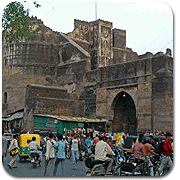 Bhadra fort which was constructed in the year 1411 A.D. by Sultan Ahmad Shah, the founder of Ahmedabad City is a royal fort that occupies the top most position in the Ahmedabad sightseeing tour. Made using the beautiful deep red stones the fort houses stands majestically even today. It has a magnificent palace, the arches and balconies of which are ornately embellished. The fort is well known for the Bhadrakali Temple that was built in the dedication of Hindu Goddess 'Bhadra, a different form of Goddess Kali. People are of the belief that, Goddess Lakshmi had once visited the Bhadra fort and blessed the Sultan that, his city would always remain prosperous. 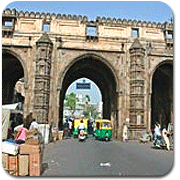 Since times immemorial, people of Ahmedabad have been wealthy and infact, Ahmedabad has throughout been the hub of trade and commerce in the state of Gujarat. 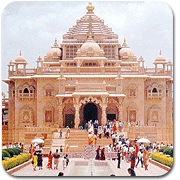 Akshardham Temple is dedicated to Lord Swaminarayn & inspired by HDH Pramukh Swami Maharaj. It is a miracle worked in traditional stones architecture & ancient wisdom. It is a place of education, entertainment and enlightenment. Hundreds of figures, dioramas, display and audio-visual shows, unfold a stream of timeless experiences make this place most admirable religious as well as tourist destination. But remember, at Akshardham you are neither a tourist nor a traveler. You're an explorer, an inventor, a sculptor. You'll discover the art of sculpting yourself from within. 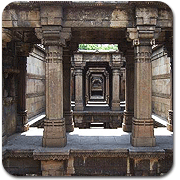 Built during the reign of Mehmud Begda in the year 1501, Dada Hari Vav is an elaborately designed octagonal shaped step well located below the ground level. The well lies just behind the tomb of Dada Hari. Made from fine stone work; it is one of the most complicated structures & has been intricately carved in the typical Gujarati Designs. The basic purpose of setting up the well was to provide the travelers with cool water and a place for relaxation. 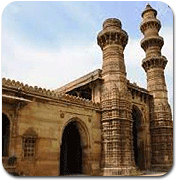 Ahmedabad is well known for its swaying minarets, more commonly known as Jhulta Minar. A classic example of superb craftsmanship, Jhulta Minar is actually a part of the mosque Siddi Bashir. The mosque has been constructed in such a manner that, if you apply a little force on its upper arc, the Minar tends to sway. For kids, Jhulta Minar in Ahmedabad, India is a real fun place. An Englishman made an attempt to demolish one of the minarets of the mosque, but all in vain. He did so to unravel the mystery behind the swaying of minarets. The mechanism that leads to vibration is still a mystery. An interesting thing about Jhulta Minar is that, it can even withstand the pressure of fast moving trains that pass from a distance not lying very far from the minaret. Sarkhej Roza contains a cluster of monuments, the origin of which can be dated back to the times of Mughal rule in Ahmedabad. It is a platform where three distinctive worlds coexist, namely royal, religious and social. The palaces and tombs form part of the royal world, the mosque constitutes the religious realm and the tanks and pavilions have given rise to the social world. The carved stone grills create an atmosphere of tranquility, thereby serving as a great retreat for people seeking peace. When you visit Sarkhej Roza, do not forget to take a look at the tomb of Saint Ahmed Khattu Baksh, the spiritual guide of the founder of Ahmedabad city. It also houses the tomb of the Emperor Mehmud Shah Beguda and his queen. 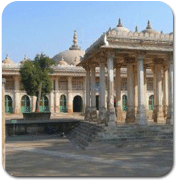 The architectural pattern of Sarkhej Roza is mesmerizing. The reflection of sunlight creates beautiful impressions. Teen Darwaza is an architectural marvel, consisting of gorgeous arched gates & one of the longest as well as the oldest gateways of the Ahmedabad city. Lying adjacent to the famous Bhadra fort, Teen Darwaza has been intricately carved. Initially, it served as an entrance to Royal Square at Bhadra Fort. The great Mughal emperor Jahangir used to come here along with his beloved wife Noorjahan, to take a look at the procession that started from this grand gateway and went nonstop till Jama Masjid. The walls and pillars of Teen Darwaza are beautifully designed. The windows of this fabulous monument are semi circular and adorned using mesh work. The central window depicts the tree of life. Five palm trees are shown that are covered with snakes. 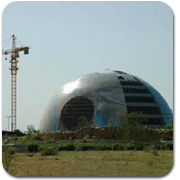 This portrayal also serves as the symbol of the Gujarat Government. 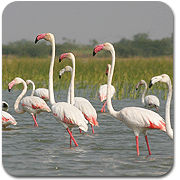 Nal Sarovar bird sanctuary is basically a natural lake that makes an excellent excursion. Spread over an area of 116 sq. km at a distance of 70 kms from Ahmedabad, it is well known for the vivid birds that migrate from Siberia. Bird sanctuary Nal Sarovar serves as an oasis of serenity in the midst of hustle bustle of city life. Flocks of birds, consisting of flamingos, ducks, geese and pelicans, visit this Lake. It appears like a fairyland on the full moon nights. Some of the birds that can be more commonly found here include osprey, harriers, flamingoes, pelicans, storks, ibises, wading birds, geese, cranes, spoonbill, swallows and fishing eagles. Apart from the colorful humming birds, another major attraction of Nal Sarovar bird sanctuary consists of the numerous islets that further enhance its charm. Sardar Patel national memorial was established in Shahibargh in the memory of Sardar Vallabhbhai Patel, who was a great freedom fighter. It is also known as Moti Shah Mahal. 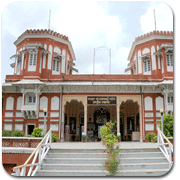 The museum houses various portraits of Sardar Patel, his family members and friends. You can also find the biography of Sardar Patel in the museum, which contains a detailed description of all the phases of his life. A major attraction of the Sardar Patel national memorial museum in Ahmedabad consists of the national flag that was designed by the Indian National Congress in 1930 -1931. In the surroundings of the museum, lies a garden called Sardar Open Garden. Besides the museum and garden, there is also the Sardar Open Air Theatre, where documentary films are shown during specific occasions. Set up in the year 1915, Sabarmati ashram was the central point from where the struggle for India's Independence was started. 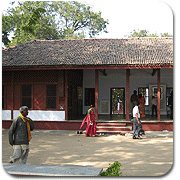 Till the year 1930, the ashram at Sabarmati was the home of Mahatma Gandhi. Bordered by shady trees, the atmosphere over here is very tranquil and peaceful. During the Indian struggle for independence, it was also referred to as the Satyagrah Ashram. The ashram houses a museum, library, auditorium and photo galleries. 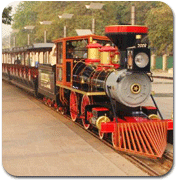 The museum exhibits the life of Mahatma Gandhi. There is an archive of letters written by Gandhiji. Also, the museum contains the manuscripts of his articles; several films composed on the life of Gandhiji & India's freedom struggle etc. There are plenty of books in the library that will give you a valuable insight into the life history of Mahatma Gandhi. Amidst the mad rush of the city, Sabarmati ashram serves as a great retreat. Copyright © 2012 Divyatravels.in. All Rights Reserved.